Lately I have been thinking a lot about film photography. I recently posted some images taken with a Diana F+ plastic lens camera and 120 roll film. Yesterday I bought new batteries for some old film cameras and a bunch of rolls of fresh film. I shot half of a roll yesterday, and of course do not know how any of them came out. In fact, I have only vague recollections of what half of them were. since it is overcast today, I do not know when I will be able to even finish the roll to put it in to be processed. It is hard to get used to this delayed gratification thing. So it is perhaps no surprise that I ended up processing this HDR shot with a pair of film photography plugin filters. First I used the Cross Processing filter in the OnOne Photo Tools suite. Cross processing is a film processing technique in which you use chemicals meant for one type of film on another. For example, you might use the chemicals for slide film on a print negative. Then I switched to Nik’s Color Efex and used the Film Effect filter, which has presets for a good number of film types. I chose Fuji Velvia, which is famous for hyper-saturated colors. And that was it. 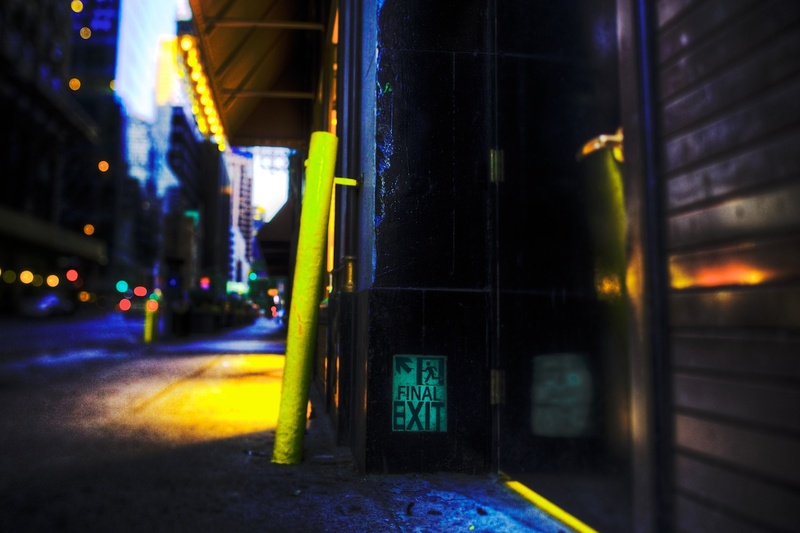 Apart from the HDR merge, I didn’t do anything else, except brush in some added brightness to the Final Exit sign. This was shot with the 24mm tilt-shift. I feel lucky to have noticed the sign. I’m reasonably tall and have to discipline myself to remember to look down, crouch, and check for different perspectives when shooting. I like the composition and the post. Blue and yellow color pair works well. Like the little circles.